"Icons of Anti-Evolution" website addresses Jonathan Wells's book Icons of Evolution! The Discovery Institute of Seattle has been making a lot of noise about evolution lately. When some opposed the Melvindale, Michigan school board's approval of "intelligent design" books such as Michael Denton's "Evolution: Theory in Crisis" or Philip Johnson's "Darwin on Trial" for placement in school libraries, the Discovery Institute (DI) dispatched senior fellow Jonathan Wells to write an editorial in the Detroit News defending the board's actions. When several prominent textbook authors and scientists defended evolution's inclusion in school science texts last month, the DI issued their own press release expressing their opposition. One theme that's "hot" at DI is the continual running down of "Darwin's Theory," "Darwinian evolution," "Darwinism" and so on, while never mentioning "evolution" or "descent with modification." They act as if recent discoveries in genetics, DNA, molecular biology and paleontology haven't supported and expanded our understanding of evolution, when they clearly have. The DI folks claim the example of natural selection causing color changes in moths has been completely discredited (it hasn't), and they claim all "types" of life arose during the Cambrian Explosion. [See our comments on these arguments and the Melvindale book flap, below.] Wells will be at the SSE meeting here in Albuquerque in June. There is a controversy in Melvindale, Michigan involving placement of books critical of evolution in school libraries. Jonathan Wells of the Discovery Institute in Seattle says it is about censorship and "fairness." (Detroit News - Sunday, March 14.) It is really about quality education. The Melvindale district school board's own resolution required that books for use in the schools not be about creationism or "religion in disguise," but instead be fully scientific. But several books that they approved, and which Wells also wants placed on the school library shelves, are depressingly un-scientific and philosophical. These books are littered with scientific-sounding arguments that often misrepresent or distort the findings of modern science. The real force of Wells' argument is an appeal to our sense of "fairness" and "rights." After all, isn't it only "fair" that our children have the "right" to "
read arguments against it [evolution] in their school libraries?" Wells even proclaims that "Anything less would dishonor those before us who fought and died..." Would Wells be using the same logic and words to defend the equally silly inclusion of books in school libraries on Satanism or, perhaps, Lady Chatterley's Lover. After all, isn't it only "fair" that our "children" have the "right" to read arguments against Christianity so they can decide if Satanism is worth following? Isn't it only right that our children read about alternate sexual life styles so they can make up their own minds about promiscuity? Didn't our forefathers fight and die for these rights? Regardless of what Wells claims, this is not a case of fairness or patriotic rights. In fact, this is not an issue of whether or not a school district should allow students to see "both points of view." It is an issue of certain people trying to make a back-door run around laws and constitutional intent which prohibit specific, religious advocacy in the public schools. Each and every book that Wells wants put on library shelves is motivated by the belief in a very specific religious viewpoint - not by the efficacy of the books to dispute one of the best standing theories in science. The modern theory of evolution is on the same level of scientific acceptance as the theory of gravity, despite what lay critics might say. And since these books provide twisted "refutations" of almost every facet of biological evolution, they embody a subtle, yet sinister form of censorship and mind control. Do you want your child presented with falsehoods stated as a fact for the sake of "fairness?" Since when have school libraries not carefully selected their books so that our children are presented with the best educational value? Don't you, as parents want the best, most up-to-date, accurate scientific learning materials available for your children? Do you really want your children to be misled into reading high sounding, controversial religious philosophies, full of scientific errors, as if they were science? Since the libraries use books chosen by adults, the choice of these misleading books is what is really unfair, illegal, immoral, and very much against what our founding fathers really fought for. Fortunately, mainstream science, the constitution, and the courts agree with us. We applaud the courage of those folks in Melvindale who also agree and stand up for what is really fair. (Lest we be criticized for ignoring the "evidence" Wells and his Discovery Institute colleagues have been harping on lately, here are some brief comments on a few of their arguments. Wells states that "
Jonathan Wells, of the Seattle-based Discovery Institute, has sent NMSR a letter commenting on several of the points raised in the April 1999 issue of NMSR Reports ("Discovery Institute Goes on Warpath," "Melvindale Book Flap"). Here is his letter, and our reply. Your articles referring to me in the April, 1999, issue of NMSR Reports (Vol. 5 no. 4) have been brought to my attention. Obviously, we disagree over the merits of Darwinian theory, but that is not why I'm writing to you. I write in the hope of clearing up some potential misunderstandings about my position. Regarding the peppered moths: Kettlewell's experiments supposedly demonstrated that cryptic coloration and selective bird predation are the principle causes of industrial melanism were discredited by (a) findings in the 1960's and 1970's that other factors (such as migration and non-visual selection) had to be invoked to account for observed geographical distributions, (b) reports that the rise and fall of melanism were not correlated with lichen cover on tree trunks in the U.S. or many parts of the U.K., (c) research in the 1980's showing that peppered moths in the wild do not normally rest on tree trunks (where Kettlewell conducted his experiments), and (d) revelations that all photographs of peppered moths on tree trunks have been staged, either by manually positioning live moths or by pinning or gluing dead ones. I do not deny that selective bird predation may have been one factor (among several) in the rise and fall of industrial melanism in peppered moths, and I do not question the integrity of Kettlewell or others who did the research. I do, however, object to the fact that textbooks continue to give students the impression that Kettlewell's experiments demonstrated empirically that industrial melanism is a simple case of natural selection. I also find it unacceptable that many of those same books continue to contain staged photos of moths on tree trunks, ten years after biologists learned that is not where they naturally rest. I consider this a misrepresentation of the truth which makes for bad science education. Regarding the Cambrian explosion: It's true that in my Melvindale op-ed piece I wrote that "all the major types of animals" arose in the Cambrian, by which I meant the major animal phyla. There is no substantial controversy over this among paleontologists. I used "major types" instead of "phyla" because of the audience I was addressing, but this usage is not unique among science writers. As you correctly point out, the various classes of vertebrates arose later; but the chordate phylum is represented in the Cambrian fauna. 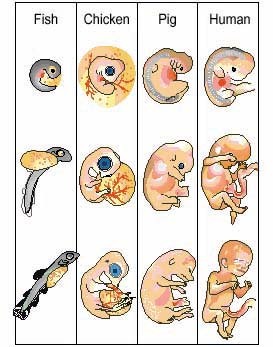 Regarding gill slits in embryos: human embryos do not have gill slits. They have pharyngeal arches and pouches (ridges and folds in the neck region). Only in fish and amphibians do these later develop into gills; in other vertebrate classes they never take on any of the morphological or physiological attributes of gills, but develop into other, unrelated structures. Calling pharyngeal pouches "gill slits" in human embryos is reading Darwinian theory into the evidence. Many current biology textbooks use distorted pictures of vertebrate embryos to convince students that vertebrates share a common ancestor. See, for example, the latest edition of Miller and Levine's BIOLOGY, one of the most widely used high-school texts. Regarding developmental mutations: I do not deny that some mutations are beneficial, e.g. mutations contributing to antibiotic or insecticide resistance, or enabling bacteria to grow on novel substances (such as the example you give of the nylon-waste-eating bacteria). These are not "developmental mutations," however, since bacteria do not develop. Saturation mutagenesis screens in multicellular organisms such as fruit flies, nematode worms and zebrafish, which produce all possible developmental mutations, have never found any that are beneficial. Regarding natural selection: I do not claim that peppered moths are the only example of natural selection; I claim that they may be the only good example above the molecular level of a change in gene frequencies due to natural selection. Certainly, there are plenty of examples of this at the molecular level (e.g., antibiotic and pesticide resistance). But in most of the classic examples of natural selection above the molecular level (e.g., Darwin's finches, Hawaiian Drosophila, and the squirrels and lizards you cite), the genetic basis is unknown. If you know of a good example I've missed, I would stand to be corrected on this. Some of these points may sound like technicalities. But I try to be very careful about what I claim. If any claim I make is inaccurate, which is to say contrary to the evidence, I will correct it. I prefer to base my claims on actual evidence, rather than on what Darwinists assure me is the case. Thank you for agreeing to have your letter printed in this issue of NMSR Reports. You brought up several interesting points. Here are our responses. Regarding the peppered moths: This turns out to be a rather complex issue. Michael Majerus, an expert on the peppered moths, recently published a book about them entitled Melanism: Evolution in Action (Oxford, Oxford University Press, 1998). One of Majerus' main points, in a chapter entitled "The Peppered Moth Story Dissected," is that "The case of the peppered moth is undoubtedly more complex and fascinating than most biology texts have space to relate." Elsewhere, he states "The findings of these scientists show that the précised description of the peppered moth story is wrong, inaccurate, or incomplete, with respect to most of the story's component parts. When details of the genetics, behavior, and ecology of this moth are taken into account, the resulting story is one of greater complexity, and in many ways greater interest, than the simple story that is usually related." But Majerus is not attacking the basic hypothesis that industrial melanism is due to birds eating more of the moths that stick out against the background; in other words, that the shift in coloring of the moth population is due to natural selection. In fact, Majerus himself pointed out recently that "it is the text book précised account of the peppered moth story that I criticize, not the scientific accounts published in peer reviewed scientific journals." (Personal communication, to Donald Frack, posted on Internet April 6, 1999.) But most critical to this discussion is Majerus' conclusion: "Of all the people I know, including both amateur and professional entomologists who have experience of this moth, I know of none who doubts that differential bird predation is of primary importance in the spread and decline of melanism in the peppered moth." (Ibid.) This is, of course, a very different conclusion than that drawn by Jonathan Wells : "Kettlewell's experiments supposedly demonstrated that cryptic coloration and selective bird predation are the principle causes of industrial melanism were discredited..."
It turns out that detailed models of peppered moth evolution have been refined with inclusion of effects besides differential bird predation, such as migration. But the effects of these secondary mechanisms were generally slight. Researchers found that the only significant such factor was migration, but that even that was much less important than bird predation. So the fact that other factors were "invoked" does not alter the basic conclusion that melanism in the peppered moths demonstrates natural selection in action. (b) reports that the rise and fall of melanism were not correlated with lichen cover on tree trunks in the U.S. or many parts of the U.K.
Wells refers to researchers who found that the moths sometimes preferred resting sites besides tree trunks, such as under branches high in the canopy. Two points are important here. Point (1): "Do not normally rest" is not the same as "never rest." Consider the following numbers of moths found resting in various sites between 1964 and 1996 (Majerus 1998, Tables 6.1 and 6.2, page 123): In the wild, 32 peppered moths were found on exposed trunks, unexposed trunks, and trunk/branch joints, while 15 were found on branches alone. In the vicinity of light traps, another 135 were found associated with trunks, and 20 with branches alone, for totals of 168 associated with trunks, and 35 with branches alone Clearly, Wells' implication (stated explicitly elsewhere, for example the Detroit News, March 14, 1999) that peppered moths do not rest on tree trunks is simply not supported by the available data. Point (2): Majerus and others have performed new experiments, in which moths were marked and released, allowed to rest wherever they wanted (trunks or not), and then recaptured (if possible). The numbers of moths recaptured were different in polluted woods then in unpolluted woods, again supporting the differential bird predation hypothesis, i.e. that moths that blend in better with available backgrounds tend to have a better chance of survival. (d) revelations that all photographs of peppered moths on tree trunks have been staged, either by manually positioning live moths or by pinning or gluing dead ones. First, Majerus' 1998 book contains pictures of moths resting on tree trunks of their own accord, directly contrary to Wells' claim above that 'all' such photographs have been staged. Secondly, the purpose of such photographs is to illustrate crypsis (blending in with the background), not the "normal" resting place of the moths. Of course, if photographs have been staged, mention should be made of that, but that should not detract from the usual purpose of the photographs (demonstration of crypsis). Regarding the Cambrian explosion: When Wells stated that "all the major types of animals appeared abruptly about 530 million years ago, in a geological period known as the Cambrian" (the Detroit News, March 14, 1999), he was careful not to be too precise about his definition of "types." The lay reader might think of these types as specific - for example, a "rabbit type" or a "shark type." Wells acknowledges that the "types" are indeed phyla, major groups of animals. There are still two problems here. First, in the Cambrian, the representatives of the "vertebrate phylum" were squiggly little creatures like amphioxus with a fledgling backbone (notochord). If all the vertebrates since then (brontosaurus, trout, whales, humans, to name just a few) are simply "variations within a type," as Wells apparently suggests, then it appears that Wells is about 90% "evolutionist." And if these striking vertebrates are more than just "variations within a type," then what was Wells trying to say about all major "types" appearing in the Cambrian? Secondly, not all phyla first appear in the Cambrian. Bryozoan fossils are abundant in New Mexico, but the phylum Bryozoa doesn't appear until the Ordovician. And one phylum is all it takes to refute the statement that "all the major types of animals appeared abruptly in the Cambrian." Regarding gill slits in embryos: In our editorial in the April 99 NMSR Reports, we stated that "... human embryos do indeed have gill pouches in one stage of their development. This doesn't prove that humans evolved, but does indeed support the notion that humans and fish share some common biological characteristics." We agree with Dr. Wells that it would be improper to call these pouches "gill slits," and we point out that we simply did not do so, contrary to his assertion. However, we have found examples of fairly recent biology books showing greatly exaggerated embryonic development, just as Wells claimed existed. These are based on drawings by Ernst Haeckel, and were first published 125 years ago. In these drawings, the embryos of vertebrate species (salamander, human, rabbit, chicken, and fish) appear to look much more similar than they, in fact, actually appear. Wells complains that the latest edition of Miller and Levine's BIOLOGY, one of the most widely used high-school texts, still contains these flawed diagrams. I contacted one of the book's authors, Professor Kenneth Miller (Brown University), who responded that he, after learning of Richardson's work, "... immediately posted a correction of our 'mistaken' diagrams on the Internet late in 1997, at http://BioCrs.biomed.brown.edu/Books/Chapters/Ch%2010/Haeckel.htm " (Personal communication, May 14, 1999). The edition of Miller and Levine's Biology that Wells criticizes is the 4th edition, which was actually written before the Richardson paper on Haeckel appeared in 1997. The latest edition (5th ed., first published in March of 1999 and bearing a 2000 copyright) has corrected diagrams, re-printed here with permission. We encourage everyone curious to see what real vertebrate embryos of various species (human, chicken, pig, fish) look like during development to check out the spectacular NOVA episode "Odyssey of Life" featuring Lennart Nilsson's incredible time-lapsed embryo micrographs. Links are available at Miller's aforementioned website. We agree with Wells that such distortions do no good, and should be eliminated as quickly as possible from curricular materials. We also agree with Jonathan Wells' conclusion on the matter, published recently in an article entitled "Haeckel's Embryos and Evolution: Setting the Record Straight" (The American Biology Teacher, Vol. 61, No. 5, May 1999): "This does not mean that students interested in evolution should be discouraged from studying embryology. On the contrary, the interface between evolution and development is one of the most exciting research areas in biology today."
. The fact that inducing saturated levels of mutations hasn't yet produced radically different species does not prove that such developmental processes are impossible in nature (where these processes require many generations, significant populations, and low levels of mutation), nor does it prove that such processes are impossible in the laboratory (it's probably just a matter of a few years or decades). Regarding natural selection: Wells claims that "peppered moths... may be the only good example above the molecular level of a change in gene frequencies due to natural selection.... in most of the classic examples of natural selection above the molecular level (e.g., Darwin's finches, Hawaiian Drosophila, and the squirrels and lizards you cite), the genetic basis is unknown." It's true that, until recently, the actual genetic relationships among Darwin's finches were not known. But that has changed with the recent publication of "Phylogeny of Darwin's finches as revealed by mtDNA sequences," Akie Sato, et. al., Proceedings of the National Academy of Sciences USA, Vol. 96, pp. 5101--5106, April 1999. In this paper, detailed studies of the mitochondrial DNA of the 14 recognized species of Darwin's finches on the Galapagos and Cocos islands confirm what Darwin hypothesized long before our knowledge of DNA: namely, that the finches, with their incredible variety of beaks, all arose from a single common ancestor. The study shows that the Warbler Finch is closest to the ancestor of the monophyletic group, which was probably similar to the modern dull-colored grassquit. The vegetarian finches are another side branch. After their appearance, the main family tree develops two major branches: the ground finches (six species) and the tree finches (six species). The Cocos finch is closely related to tree finches, showing that the Cocos Islands were colonized from the Galapagos. We encourage Dr. Wells to look into this spectacular example of change in gene frequencies due to natural selection.